A recent study by Stanford University offers compelling insight into a longstanding argument about human sexuality. 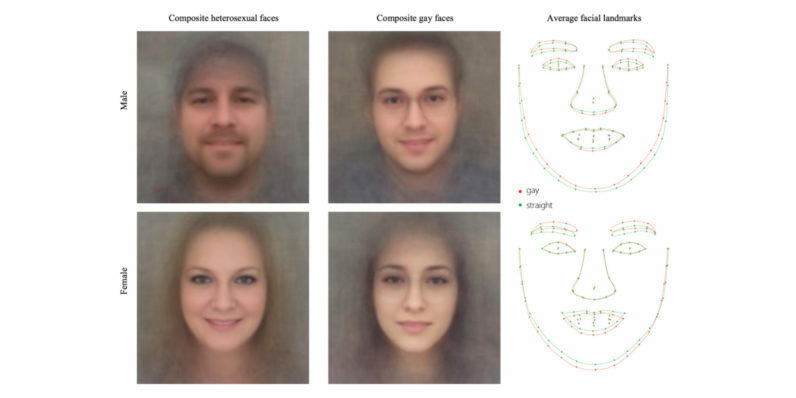 Published today, the study analyzed more than 35,000 facial images and built an algorithm that, with shocking accuracy, predicted a person’s sexual orientation. With a single photo, the algorithm correctly guessed whether men were straight or gay with 81 percent accuracy. For women, the results were a bit lower, but still impressive at 74 percent. When fed five images per person, the accuracy increased even more — 91 percent for men and 83 percent for women. Researchers Michal Kosinski and Yilun Wang first pulled thousands of images publicly available on an online dating site. Aside from the sheer number of images available to pull from, the men could determine sexual preference based on user profiles. From there, they compiled the data set and extracted facial features using deep neural networks to sort the images. What they found was, gay men tend to have “gender-atypical” features, expressions, and grooming styles. Simply put, to the algorithm, these men often appeared more feminine and often had narrower jaws, longer noses, and larger foreheads than straight men. Gay women were the opposite, generally having larger jaws and smaller foreheads. Interestingly, the researchers believe the lower success rate in guessing sexual orientation in females could support the notion that female sexual orientation is more fluid than that of a male — or it could be due to fewer physical differences found in gay and straight women as opposed to their male counterparts. While perhaps oversimplifying the dynamic nature of both gender and sexual orientation, the algorithm still managed to correctly identify hetero- and homosexual men and women at rates far exceeding humans. Humans correctly identified sexual orientation only 61 percent of the time in men, and 54 percent in women. And possibly the most promising part of the study was “strong support” in the theory that sexual orientation stems from exposure to specific hormones before birth. Or, to put it simply, some people are indeed born gay.